First: it's not macOS itself which is vulnerable in the first place but the firmware and related hardware is affected. In a second step your system may be attacked though. An ME entry in Family denotes Management Engine code. In an EFIFirmware2015Update.pkg 2 of 21 firmware files contain Intel Management Engine code which may be affected by CVE-2017-5705|5708|5711|5712. In the macOS 10.13.1 update.pkg 21 of 46 firmware files contain Intel Management Engine code which may be affected by CVE-2017-5705|5708|5711|5712. One source and a linked source therein state that "Intel ME is baked in every CPU but according to The Register (0) the AMT part is not running on Apple hardware." AMT is also related to an older vulnerability and the Register link refers to this. Then the firmware may not be affected by CVE-2017-5711|5712 because AMT isn't present on Macs. But some of the recent vulnerabilities don't require AMT. 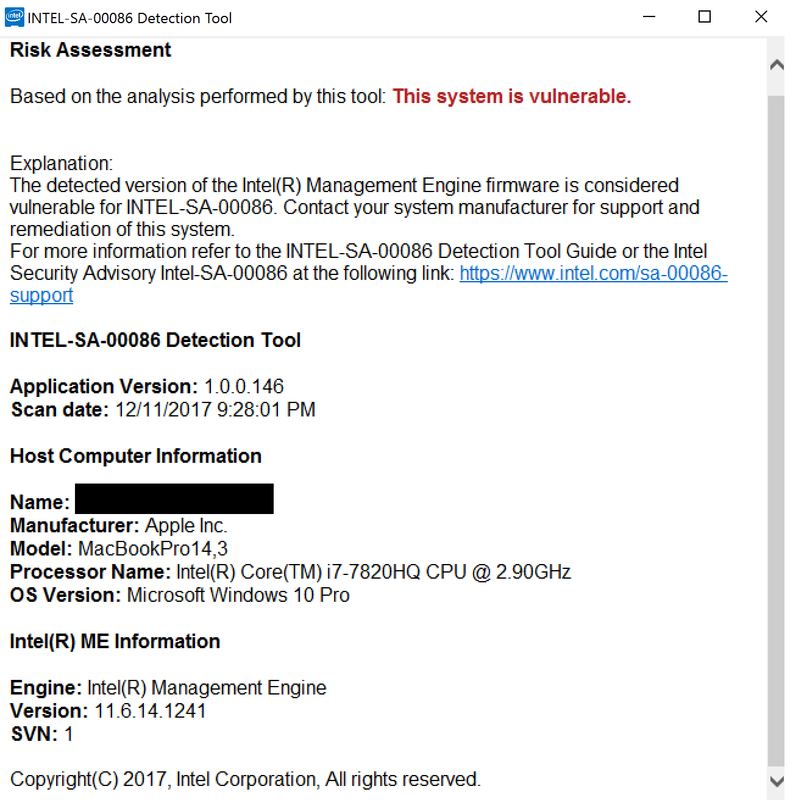 In my opinion it's unclear whether Macs are affected by the Intel Q3’17 ME 11.x vulnerability - probably only Apple can tell. At least Macs are not affected by the SPS 4.0 and the TXE 3.0 bugs! I can confirm, with info directly from my local Apple Store, that Intel Macs do indeed ship with Intel ME hardware, and that Apple does not modify any Intel hardware. Though at this point I can't confirm or deny that macs run Intel firmware or not for ME, the other answers to this question seem to suggest that they do run Intel firmware. You need to update to 11.8.0 or up. In particular, this hack is so troubling because it "allow[s] [an] attacker with local access to the system to execute arbitrary code. Multiple privilege escalations ... allow unauthorized process to access privileged content via unspecified vector. ... allow attacker with local access to the system to execute arbitrary code with AMT execution privilege. ... allows attacker with remote Admin access to the system to execute arbitrary code with AMT execution privilege." "Execute arbitrary code, privilege escalation, remote access to system and execute arbitrary code." This is insane! Especially because Intel ME allows for remote access even when a system is powered off, though that might only be with AMT software, which apparently Apple does not have. Excerpt from INTEL-SA-00086: "The attacker gains physical access by manually updating the platform with a malicious firmware image through flash programmer physically connected to the platform’s flash memory." Unless your Apple product is operating in a public lab where nefarious people may gain physical access to the device, you probably don't have much to worry about. The security advisory doesn't mention it, but I read elsewhere on a PC/Windows forum the attack comes to Flash Descriptor firmware via a USB port (flash drive). There is already USB-flash technology to hijack an Apple computer using a limited Linux kernel on a flash drive. For most people this won't be much of an issue. Not the answer you're looking for? Browse other questions tagged macos mac security processor . Have Apple announced whether the “Shellshock” bash update will be applied automatically via the App Store patching mechanism? Is any version of OS X/macOS vulnerable to the Year 2038 problem? UHD Blu-ray playback on iMac 5K 2017?